Lab markers are formulated for laboratory and industrial use. Lab markers can write on practically any surface. The ink in lab markers resists most chemical washes, steam and heat up to 500° F / 260° C. Write on almost any surface, metal, glass, plastic, cardboard, or wood with a permanent paint marker, available in a variety of colors. The unique valve prevents the tip from drying out. 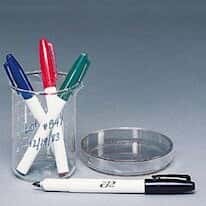 Most lab markers write on cold, wet surfaces and have quick drying ink that will permanently mark plastic but will wash off glass, metal, or porcelain.